Meghan Markle fuelled pregnancy speculation on Twitter after wearing Givenchy navy blue coat. 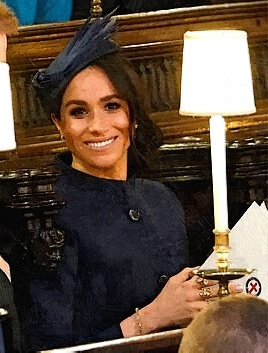 Royal fans thought that Duchess of Sussex chose the wide-fitting coat to Princess Eugenie’s wedding to cover up the beginnings of a baby bump. Her coat and matching dress were made by favorite label Givenchy, who also designed the Duchess’s own wedding dress. The 37-year-old Duchess completed her look with a pair of navy Manolo Blahnik heels and a hat by Noel Stewart. One observer reveals that Meghan Markle is either pregnant or the type to get chilly easily when she’s wearing a heavy coat indoors. However, it seems that the pregnancy might not be happening in the future because Meghan will shortly be visiting Tonga and Fiji which pose a risk of infection by the Zika virus. She will join her husband to have 16 days travelling around Australia, Fiji, the Kingdom of Tonga, and New Zealand from October 16 to 31. Is Justin Bieber Applying To Become A U.S. Citizen?